The title “Personal Trainer” is a universal name for professionals who dedicate themselves to helping others succeed in their fitness goals. However, working with a personal trainer can be about so much more than just basic fitness. In particular, there are three areas I would like to emphasize in which a personal trainer can impact their client’s life - Health, Wellness, and Daily Activities/Sports. Personal trainers are here to better your health, not just to make you look physically fit. Your health is the number one goal from a trainer’s perspective; if you don’t have your health, your life will be limited to some extent. Why should you hire a trainer to be healthy? A trainer can help you to plan for a healthy combination of cardiovascular and musculoskeletal exercise. Currently, the American College of Sports Medicine (ACSM) exercise guidelines for aerobic physical activity is a minimum of 150 minutes of moderate intensity, or 75 minutes of vigorous activity, or a combination of the two intensities. In addition to aerobic exercise, it is recommended to perform resistance training at least two days per week. A trainer can ensure you are maximizing your health benefits by creating specific plans to achieve these goals, all while making it fun and enjoyable. A trainer can help to keep you accountable and on track. A plan is good, but the trainer can help you stay focused on the goal and help you achieve what you are aiming for. For example, if you reach the guideline goals above you are reducing the risk of cardiovascular disease, stroke, and certain cancers, along with stabilizing, improving, or eliminating hypertension, diabetes, obesity, and age related degeneration. Trainers are supportive; they are here to help you with any struggles that are preventing you from achieving your goals. Trainers want you to escape your mental barriers so you can experience the feeling of overall wellness; therefore they will help you move past any fears, thoughts, frustrations, or difficulties you have with exercise or life. Most importantly, as these obstacles are being conquered a trainer will be helping you establish self-efficacy in your new healthy lifestyle change. A trainer can help people with wellness goals specific to where they are at in life. For example, a trainer working with an older client may tend to focus more on incorporating balance exercises or encourage cognitive thinking to maintain and improve the mind. There are many ways a person can benefit from having a trainer who uses neuroplasticity exercises, some include an increased mental focus, memory recognition, and multitasking. A trainer can help you with functional exercises that impact your safety and ease in accomplishing your daily activities. People of all ages can benefit from having an increased capacity and margin of safety in what they do every day. A trainer can help you improve sport related skills. Many people wouldn’t think of a trainer as a sport-related coach, but they are. They can give you or your child the one on one attention needed to specifically improve as an individual athlete. Trainers design programs to enhance the individual athlete in areas like sport specific speed, power, strength, and endurance as well as work with reactivity and agility training. This may ultimately give the athlete the upper hand over the others that simply attend the sport practices. A trainer can help make sure the body is both biomechanically and physiologically working the way it should for optimal performance on game day. Personal trainers can look for imbalances within the body and create a plan to correct the discrepancies. This may reduce the risks for injury and remove impediments to performance. You may have heard a fitness professional be called a Health and Wellness Coach, Sports Performance Coach, or Fitness and Wellness Specialist. These are just a few different areas of expertise that a trainer may develop in addition to their knowledge of general fitness. A trainer can positively impact your life in many ways. Whether you’re struggling with your New Year’s resolution or looking to improve your game a trainer can be a great resource to draw upon to help you on your way. If you’re new to the club, be sure to take advantage of your two free Personal Training Orientation sessions. If not, there are several options available for a trainer to help you succeed in your goals! 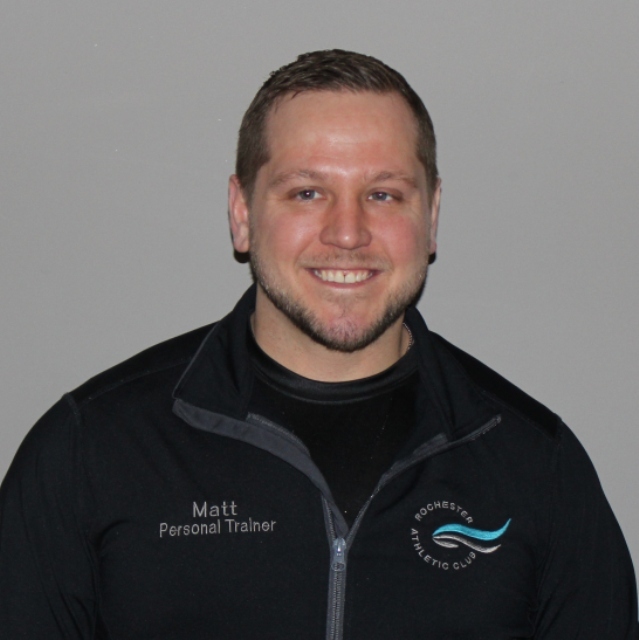 Learn more about our trainers on Meet Our Trainers webpage. Physical Activity Guidelines. (n.d.). Retrieved from https://health.gov/paguidelines/second-edition/. Contact Matt Barnett at (507) 287-9335 ext. 245.